Existing website content was too unorganized – not reader-friendly and hard to manage internally. The website was dark, hard to read and outdated-looking. Website wasn’t ranking high enough in the search engines. The site is full of duplicate content. Images have no meta data. We did an analysis of the website and social media analytics and an SEO audit. We found numerous Google penalties and on-page negligence with the SEO. Images were not optimized. Copy was not structured properly site wide (proper H1, H2, H3 tags, paragraph copy). Tons of broken links and duplicate copy. This poor structure results in various Google penalties and lowers the ranking in search results. Off page, we found inconsistent name, address and phone info in important directories. And their social media presence was negligent, at best. We did a Content Marketing Audit that shed light on who our online audience truly was and the kind of copy to push out – even when. Our keyword research revealed the subject matter of blog and social media posts that would rank highly for searches without being in the most competitive fields. I determined that a complete site re-design was the most efficient way to turn things around. At 465 pages, it was a massive, 6-month project. Tackling the home page itself was quite an ordeal. The site gets more than 50% of its traffic via mobile, so it was important to put the most important information at the user’s fingertips rather than make them fish through navigation menus. I structured it for maximum ease for exist patients, as well as hierarchically ordered to feed new prospects information and credibility intermittently… patiently coaxing them to schedule a consultation. The Before and After Galleries were in need of a massive overhaul, as users had to go through four clicks to find images — many of which were broken links. I created a very mobile-first approach that results in a one-click approach. There was a lot of duplicate copy throughout the site that I reorganized and redirected appropriately resulting in increased search results ranking. Perhaps the single biggest impact we had was on the branding. The previous content and site design was dark, unkempt and devoid of caring about the UX (User Experience) – NOT what you want from your plastic surgeon. Analytics proved that we drove more readers to the website, and held their attention, then ever before. But, most of all, we increased conversions dramatically! From our official “hard launch” in July 2016 though March 2017 when I officially off-boarded the site, leads had more than tripled from the website. During the 6-month period that I ran the old site while re-designing the new site, we averaged about two leads per week. Assuming each actual conversion is worth an average of $3k (some are just botox clients, but others are multiple surgery patients), and they have the national average closing rate of 33% of each lead, then each lead is worth $1k. We established, conservatively, 4 new leads (6 total) per week were coming in from the website. This equals 24 new leads coming in each month over what was brought in from the prior online marketing effort. $24k/month X 12 months = $288,000 per year. 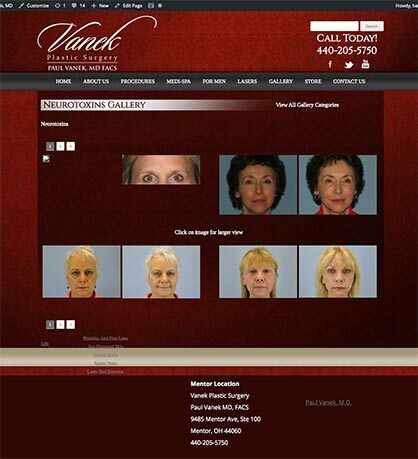 If you’re in the plastic surgery or medical field–Contact Me!